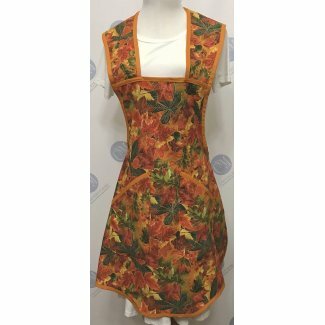 Fall is a season with beautiful colors and this apron brings those colors to life. The apron was made using a golden orange, rust and green leaf print fabric, with a vintage gold bias tape for the edges. The plus size apron is perfect for women who wear a size xl or 2xl. What makes our aprons unique: We use 100 percent high quality cotton fabric All edges are top stitched for a more professional appearance, which helps the apron to keep its shape. Our high quality aprons are made for years of wear. Long waist ties that can be tied in front or in the back. We create our own unique style Careful attention is made to detail. We use different color threads to match to match the different fabrics on the apron. 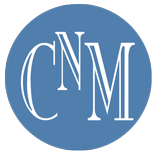 We do not mass produce and usually make only one or two aprons using the same fabric combinations. Trimmed with quality vintage gold bias tape. For some the trees are already decorated. This cute one-of-a-kind Christmas holiday ornament apron is perfect for those festive occasions and holiday traditions. 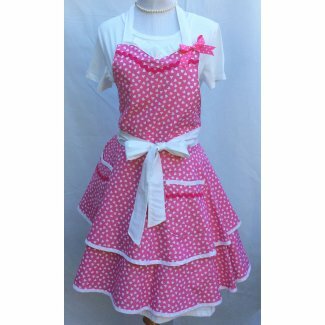 You will look so cute wearing this apron while baking Christmas cookies or the holiday meal. The apron features bright red, green, golden yellow and blue turquoise Christmas ornaments. The lined pockets and bib have been accented with a green with white snowflake print. The two tone green snowflake fabric goes so well with the greens in the ornaments. I have added a turquoise bias tape as an accent to the bodice and pockets, while the straps were made with the same cute snowflake fabric. The bodice and pockets were lined with the same cute snowflake fabric. Waist measures 27 inches, which does not include the ties. 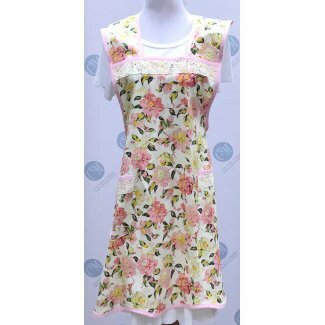 This delicate pink rose vintage plus size apron is stunning in every way. 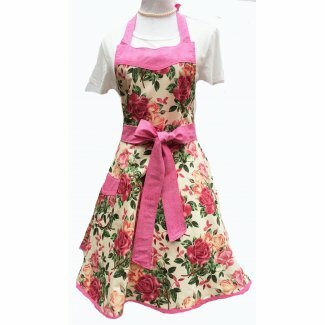 The gorgeous apron features light pink and medium pink roses. Vintage eyelet trim was used to accent the bodice and pockets, along with light pink bias tape. 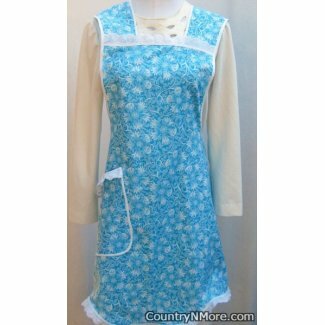 The same light pink bias tape was used to trim the apron. This has to be one of my favorite butterfly and flower aprons for plus size women. The colors of the purple and pink butterflies is absolutely stunning. Of course, what it be if there were no gorgeous purple and pink flowers to add to the mix. 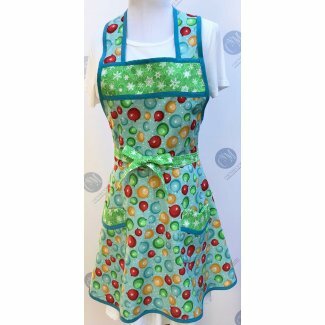 The colors are so bright and vivid that makes this a must have apron. Bring the spring indoors and look beautiful at the same time. The purple polka dot mini dot fabric was used to not only line the two pockets, but trim the pockets and trim, as well as being used for the two waist ties. The combination is absolutely beautiful. 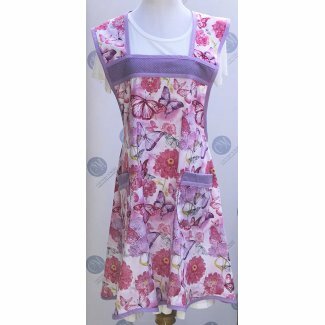 This cute retro purple and floral vintage plus size apron, is cute as cute as can be. The apron feature both large and smaller flowers. 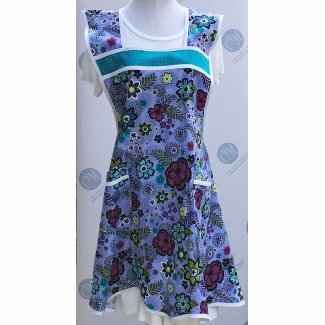 The aqua in the fabric trim fits so well with the aqua in some of the flowers. White bias tape was used to accent both the pockets as well as the bodice. The beautiful aqua fabric was used to accent the bodice, lining for pockets as well as for the straps. Two lined pockets trimmed with white bias tape. 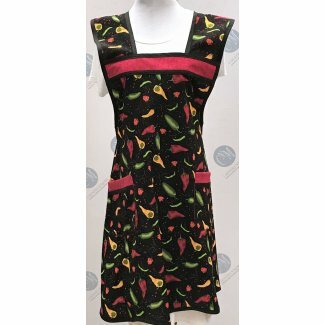 If you like chili peppers, then you will certainly like this beautiful red, green, and yellow chili pepper plus size apron. The bright chili peppers stand out against the black background. Variegated red fabric was used to line the bodice, the inside of the pockets, the top edges of the pockets, as well as the nice long straps. Two lined pockets trimmed and lined with red calico fabric. 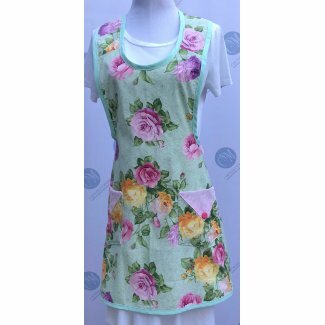 This by far, is the prettiest rose floral apron that we have made. 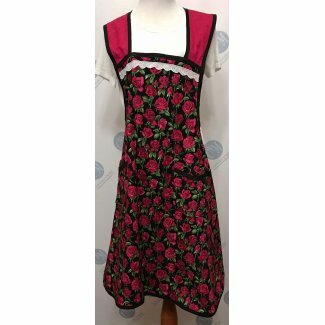 This is one of our favorite rose floral prints and the print was used to create this gorgeous rose floral vintage apron. The beautiful light and dark pink roses abound in beauty. 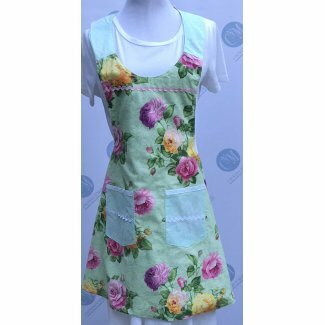 This one of a kind apron, has rose pockets with a light rose envelope style trim. We added a bright pink button for both pockets. The same light rose print was used for the waist straps, while a light green bias tape was used for the apron edges. 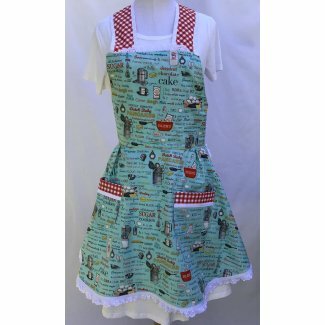 Love is the nicest gift of all and other lovely sayings adorn this sweet reversible vintage style apron. The front has heart wreaths, watering cans, sweet hearts, flowers, and butterflies. Another saying includes What's stitched with love will never tear. This other side of this sweet apron has hearts for the main apron, with the heart and watering cans for the pockets. Reversible apron-Two aprons in one! Now, butterflies are beautiful with all of the colors, but the butterflies on this vintage apron are in red, white, and blue. 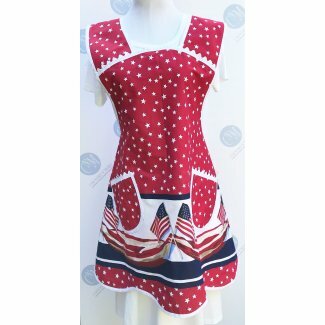 This alone makes the apron unique and perfect for wearing on a patriotic holiday, or even all year long if you like. All of the edges have been finished with gorgeous blue seam binding. This patriotic I Love USA apron, is cute as can be. 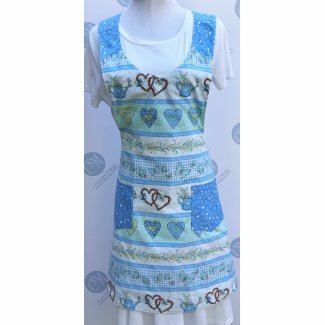 The one-of-a-kind apron features hearts with the words, "I Heart (symbol for heart) USA. The pockets are accented with a red and white checkered print, while the bodice is accented with a red and white checkered bias tape. The same red and white checkered fabric was used for the waistband, neck straps, and waist straps. The edges of the apron were finished with the same red and white checked bias tape. The hearts stand out against the light navy blue background. Waist measures 25 inches, which does not include the ties. The neck measure 27 1/2 inches and tie in the back. Waist ties measure 40 incheslong. 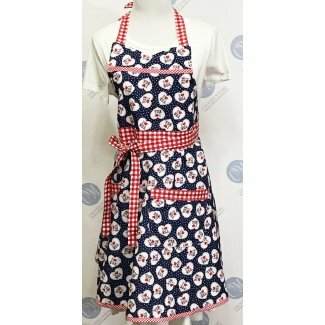 This patriotic American flag vintage apron is perfect for wearing during the holidays, such as Memorial Day, Fourth of July, and Labor Day. 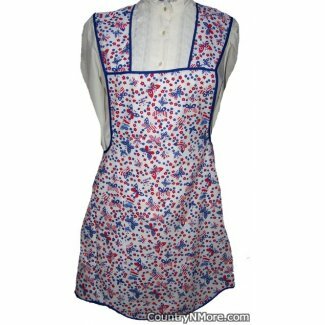 The plus size apron features white stars on a red background for the yoke and straps. The apron has a American flag and star border. 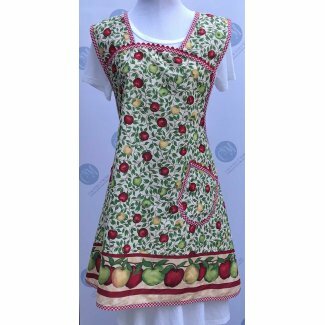 This apron is a one-of-a-kind apron, with a beautiful print and scalloped edge. 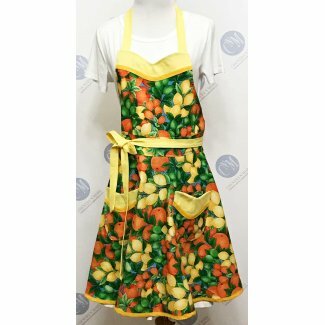 It is hard to describe this gorgeous orange and lemon pin up apron, but other than it is stunning. The apron features bright oranges and lemons, mixed with green leaves. 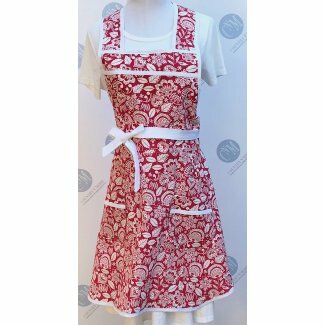 This is by far one of our favorite aprons of all time and we are sure that you will like it as well. The bodice and pockets were finished off with the light yellow with golden orange bias tape. The same yellow fabric was used for the neck and waist straps. This apron features nice long ties that can be tied either in the back or brought to the front of the apron. The pockets and the bodice are lined with the beautiful yellow fabric. Customers love the full skirted style apron. Apron has a full skirt finished off with narrow golden orange bias tape.